$2400 custom slabs for infants? Why not? 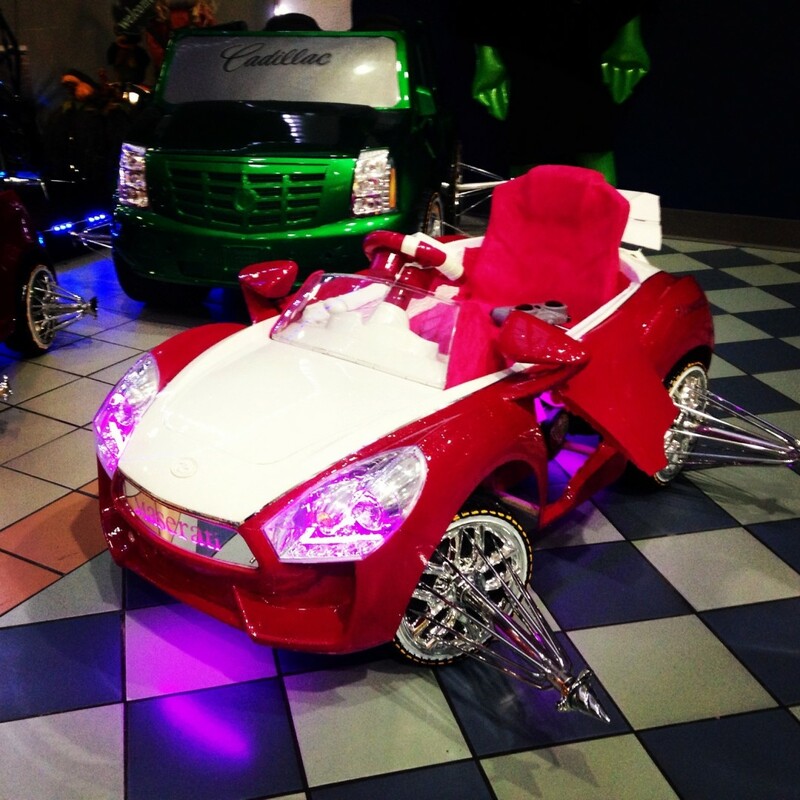 The dream of owning a custom slab starts early for many Houstonians. So early, in fact, that a select number of drivers are getting behind the wheel of tricked out rides before they've mastered potty training. Helping them fulfill their dreams is Rudy Nava, the friendly, 55-year-old owner of Rudy's Ridez, a custom car and bike shop tucked behind the foodcourt in Greenspoint Mall that specializes in miniature slabs. You may have seen Rudy's rides at local car shows or at the Armadillo Flea market, where he's been a fixture for years. "We started making these cars in our house in Spring," said Nava, a one-time plumber who began building electric cars three years ago. "Now we've grown enough to get our own store. You know, nobody is doing what we're doing." What they're doing is fairly remarkable, or insane, depending on your reaction to seeing a diapered driver "pop trunk and bang" as they, um, "grip woodgrain." "We've actually had kids as young as two-months-old in the cars," Nava said. Nava is something of an obsessive mechanical genius. Self-taught, he grew up fascinated by piping and devised his first plumbing guide at 13. He began tinkering with model cars soon after and by the 1980s he'd turned to Hot Wheels toy cars, outfitting them with hydraulics and custom paint jobs. 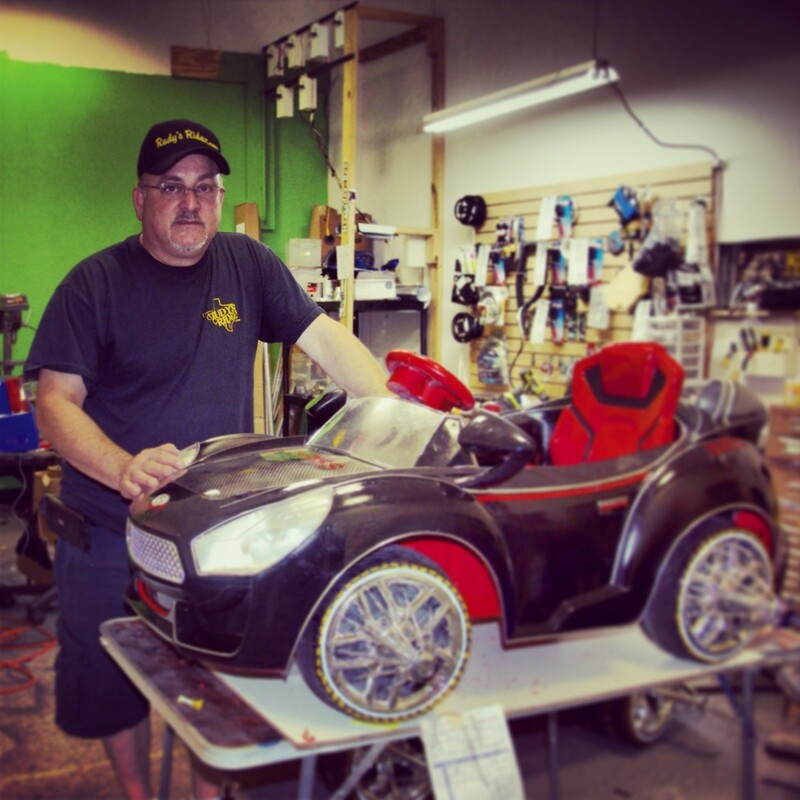 The scale of his models continued to descrease and eventually he created what he believes to be the smallest lowrider with custom hydraulic suspensions in the world. The miniscule ride, which he keeps behind a glass box in his store, is about the size of an eraser and bounces and lights up with the touch of a button. Nava approached the Guiness World Records about it several years ago, only to be turned down when they informed him they don't have a "world's tiniest lowrider category." But a man can dream, right? "Yeah," Nava said, plaintively. "Maybe some day." His electric rides start at $225, but can cost thousands more depending on the scope of an owner's imagination and budget. Rudy says the demand for his creations is increasing, especally after one of his custom bikes was featured in rapper Trae Tha Truth's video for the song "I'm From Texas." A recent ride (pictured top/bottom) topped off at $2,400 and includes LED lights, butterfly doors, custom liscense plates and a radio with a USB port for mp3 files. 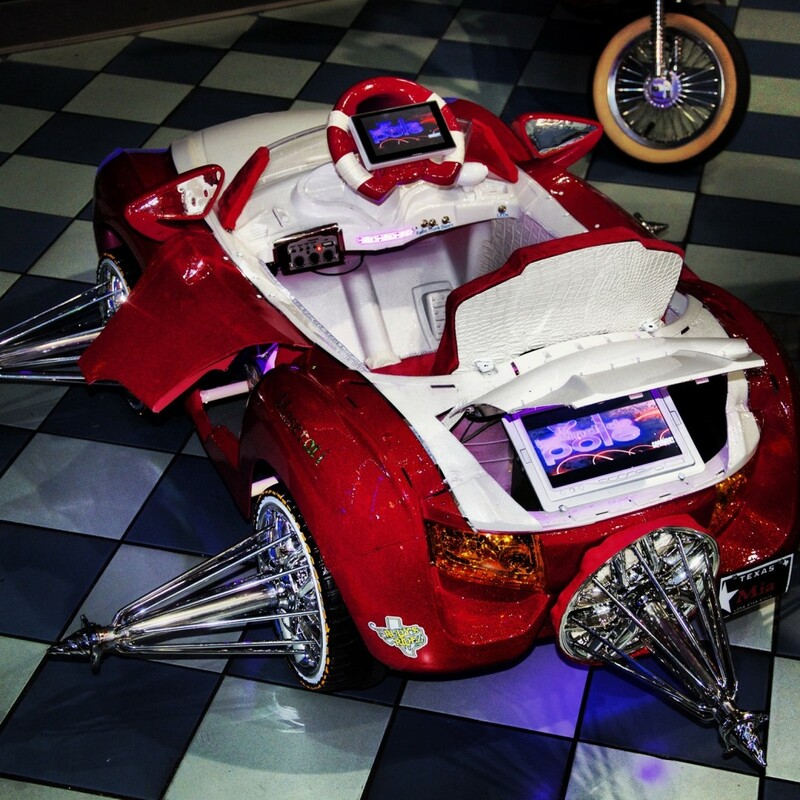 White gator suede interior–as opposed red, black, cognac or "butter ostrich"–lines the inside of the kiddie car. Custom wheels in a variety of styles, actual candy paint jobs and glitzy hood ornaments are also optional (and for a little extra Nava will be happy to slap on a few Texans' logos, too). "Pretty much anything you see in a life-size car we can do with these tiny, electric ones," Nava said, noting that individual rides can require 20 plus hours of labor and need to be ordered months in advance. Naturally, we asked for a demonstration. Rudy oblidged, flipping a switch on a handheld remote control for a mini maserati (below). Suddenly, the doors flew up, the trunk popped open and the entire car illuminated, casting the ride in a soft purple haze. A moment later two screens–an iPhone-size one on the steering wheel, the other a 7-incher in the trunk–flickered on and began blaring a graphic Lil Wayne video about female anatomy. "You can customize it to play whatever kind of music you want," he said. "Doesn't have to be Lil Wayne, of course."